A magnet for lovers of the great outdoors, Interlaken beckons with a raft of accessible adventures, mesmerizing mountain views, and a wholly international feel. Cows grazing an Alpine meadow in the heart of the Bernese Oberland. Photo by Clara Tuma. We’re standing in a darkened lounge at the venerable Victoria-Jungfrau Grand Hotel, where glass-fronted cabinets display faded memorabilia from a century or more ago. The last remnants of an afternoon tea buffet have been cleared from the center of the room, and all around us, floral stucco moldings and crystal chandeliers recall the grandeur of the Belle Époque. Niklas, the hotel’s immaculately dressed German-Malaysian sales manager, is taking me on a tour of the place. It’s not long before we find what we’re looking for: a framed black-and-white postcard from the 1930s. In it, the sight line down the Victoria’s long, balconied facade leads straight to the snow-clad slopes of Interlaken’s most famous peak. Niklas is grinning, because the scene is such an obvious fake. The Jungfrau massif in fact lies south of town, and is clearly visible beyond the sprawling meadow across the street. Whoever created this souvenir card apparently had no compunction about meddling with geography. Talk about moving mountains. 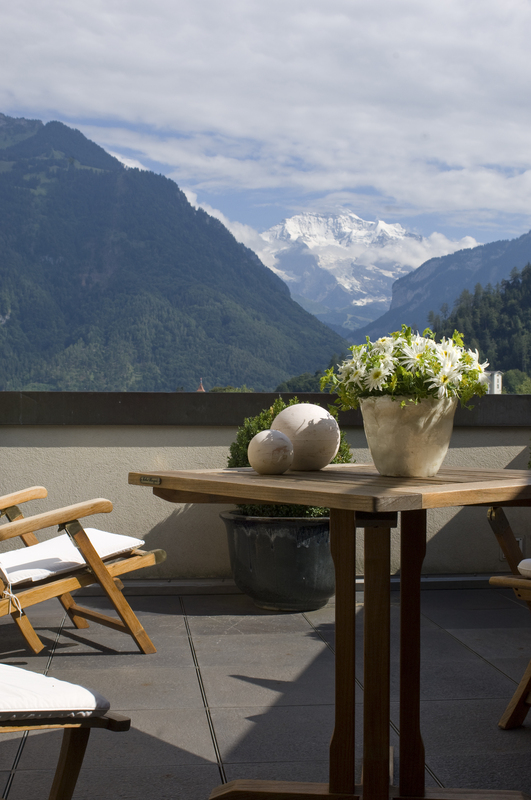 A view of the Jungfrau from a terrace at the Victoria-Jungfrau. Photo courtesy of Victoria Jungfrau Grand Hotel & Spa. Outside the hotel, I crane my neck to watch tandem paragliders as they circle and land in the middle of town. It’s a sight that is commonplace here in Switzerland’s adventure capital, whose name derives from its scenic location between lakes Thun and Brienz in the heart of the Bernese Oberland. Despite the plethora of luxury-watch shops lining its main drag, the Höheweg, nature rules supreme over Interlaken. You’re never too far from a network of Alpine hiking trails, bridle paths, rivers popular with white-water rafters, and, as that old postcard might suggest, the pure snows of the Jungfrau. 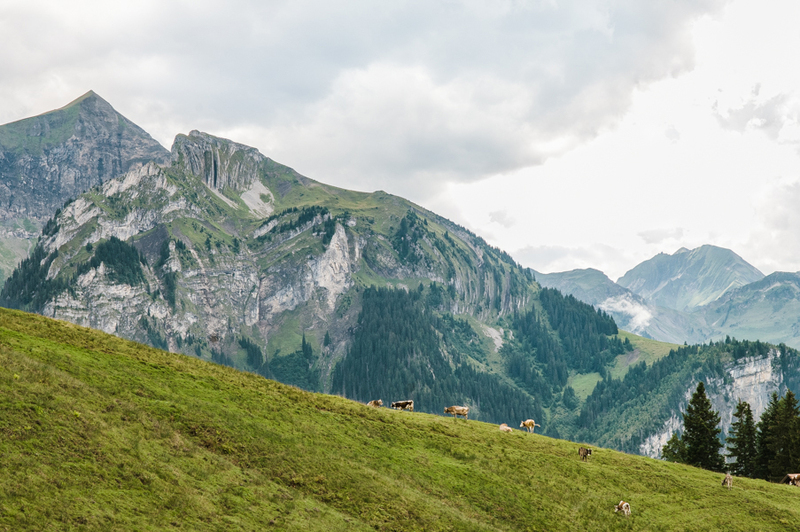 The mountain owes its name—which means “virgin”—to the nuns who in centuries past brought their sheep, goats, and cattle to graze in these highlands for 100 days each year, a tradition still practiced by many Swiss farmers today. Mönch, the adjacent peak, was named for the monks of Interlaken’s former monastery, who kept their horses below. Dissolved in 1525 during the Protestant Reformation, the monastery even had a place in developing the region’s tradition of hospitality, with a guest house built for traveling pilgrims that remained long after its monks had disbanded. Sandra Kaiser, my guide aboard Jungfrau Railways the next morning, explains how Interlaken’s thriving tourism industry first came into being. “In the 18th century, you had aristocratic families who came from Germany and England. They believed in a philosophy of going back to nature. By 1850, the place was already crowded with aristocratic tourists.” Six years later, the Victoria-Jungfrau opened as the Pension Victoria, its name an obvious nod to the reigning British monarch. The English played a major role in putting Interlaken on the map. Romantic poet Lord Byron made several visits to the region in 1816, jotting down in his journal that he’d “entered upon a range of scenes beyond all description” in the Lauterbrunnen valley. He was struck by the grandeur of its glaciers and cascades, not least the Staubbach Falls, which he compared to “the tail of a white horse streaming in the wind.” The poet went on to single out its ethereal quality, writing that it was “neither mist nor water but something between both” as it tumbled nearly 300 meters to the valley floor. In the two centuries since Lord Byron and his contemporaries explored the Jungfrau region, tourist demographics have changed considerably with the influx of a new breed of aristocrats. A slew of Bollywood movies filmed in Switzerland has made the country a prime destination among well-to-do Indian travelers, and the fresh mountain air is a welcome change from the smog-choked cities of China. There’s also no denying Interlaken’s cool appeal for those more accustomed to the desert heat of the Arabian Peninsula. 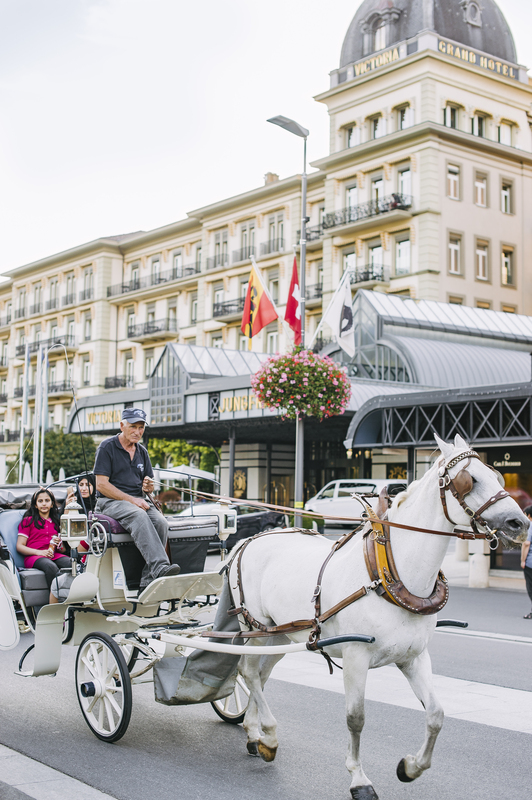 Horsing around on Interlaken’s main street. Photo courtesy of Clara Tuma. All this is evident at the Lindner Grand Hotel Beau-Rivage, a 19th-century edifice sporting mansard roofs and an imposing, arcaded facade. The sumptuous breakfast buffet here comes with falafel, samosas, spring rolls, and a large steamer of white rice, while those who work behind the counters are as international as their wide-ranging clientele. 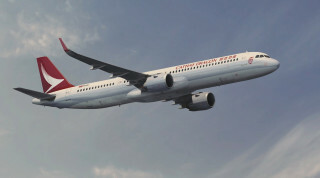 Each morning, I hear the waitstaff addressing each other in Portuguese, the bearded bartender is an Italian from Puglia, and on my first night, I am briefly introduced to a Taiwanese staff member, recruited to cater for the growing number of Mandarin-speaking guests. Indeed, what surprises me most about Interlaken is that so many people are from everywhere else. At Lauterbrunnen, the sight of multiple cascades tumbling over walls of sheer rock inspires the same sense of awe and wonder felt by Lord Byron. But while the poet had to climb a nearby hill for a closer look at the Jungfrau, Sandra is taking me much farther and higher than he ever went. Our destination is the perennially snow-covered saddle known as Jungfraujoch, where the highest railway station in Europe is perched a dizzying 3,454 meters above sea level. Opened in 1912, the station was the brainchild of Swiss industrialist Adolf Guyer-Zeller, who conceived the idea amid a craze for mountain railways at the end of the 19th century. His main challenge was excavating a curved tunnel, more than seven kilometers long, through the Eiger and Mönch mountains. 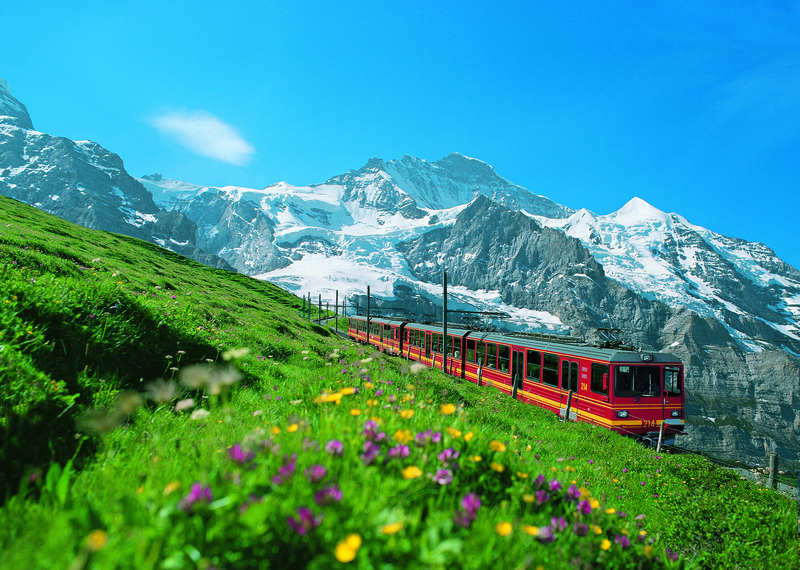 The Jungfraubahn train accompanied by the majestic backdrop of the Jungfrau. Photo courtesy of Jungfrau Railways. En route to the Jungfrau line’s lower terminus at Kleine Scheidegg, our train chugs past the Eiger Glacier, which once reached base camp for the construction workers. At this point, Sandra pulls a printout of a century-old photograph from her backpack. It’s apparent just how much the glacier has retreated since the railway was built. “At the time the tongue of ice went all the way down, and the workers would bring all their provisions in the autumn and store the meat inside the glacier. So it was like a deep freezer,” she says. 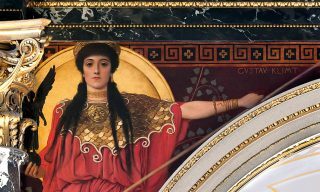 I learn that 90 percent of the laborers were Italian—and Sandra makes it clear that this was slow, arduous work, using dynamite to blast through the solid rock. The risk of avalanches and rock falls exacerbated the danger, and 30 men were killed (with 90 injured) during the course of the project. “To build the railway from Kleine Scheidegg it took two years to reach the rock face, and 14 years to excavate the tunnel,” she adds. It’s a testament to the triumph of human endurance and engineering that the journey takes just 48 minutes. The thinner air is immediately apparent upon disembarking the cogwheel train, and with Jungfraujoch nearly 3,000 meters higher than Interlaken, I’m not surprised to feel the onset of a dull light-headedness. 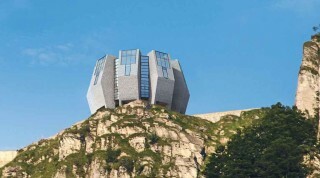 From the depths of the outcrop we take a high-speed elevator to an outdoor lookout below the Sphinx Observatory, a lonely outpost that houses an atmospheric research center. Even in low season it’s thronged with Swiss high schoolers and a motley collection of excited visitors speaking Korean, Mandarin, and Thai. The scenery is blinding white in the midday sun; Sandra points out the so-called Konkordiaplatz, a flat saddle where three glaciers meet to form the 22-kilometer-long Aletsch Glacier, the largest in the Alps. “It’s three times the size of Basel!” she exclaims. Back inside the rock formation, Sandra and I breeze through the passageways and halls of the Ice Palace, hollowed out from the Jungfraufirn glacier in the 1930s by mountain guides who used little else but ice picks and saws. Ice carvings of local wildlife decorate the niches within. The brilliance of the Jungfrau Railway lies in the fact that it takes even the most sedentary visitors to a snow-bound world ordinarily accessible only to mountaineers, climbers, and serious trekkers. 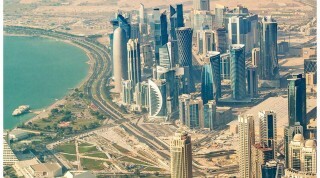 Of course, opening up such a fragile place to the masses is not without its drawbacks. 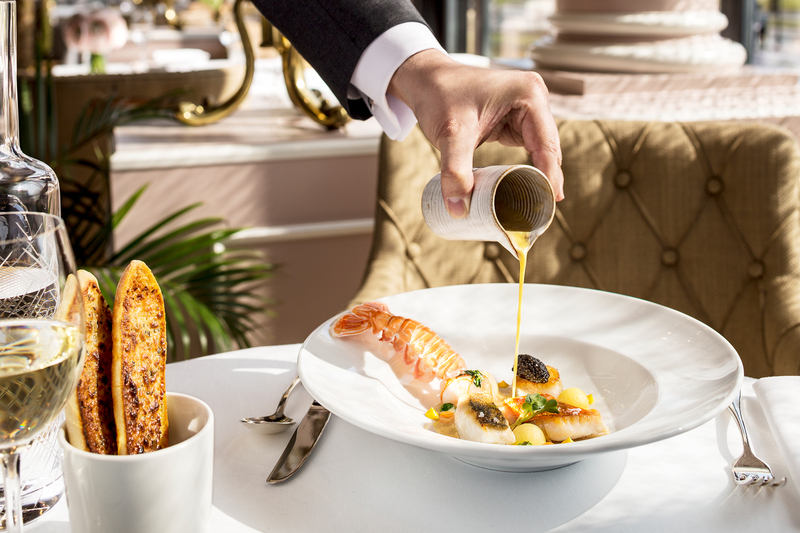 Mediterranean-inspired fare at the Victoria-Jungfrau Grand Hotel’s La Terrasse restaurant. Photo courtesy of the hotel. At the Plateau, an area where visitors can walk out onto the snow, the majority of people willfully ignore the cordon of orange and yellow ropes that mark the boundaries of a safe zone. “It’s dangerous!” Sandra exclaims. “They shouldn’t be allowed to do this!” I think of the crevasses that could be lurking beneath the glacier. Off in the distance, a member of a young Thai-speaking contingent excitedly pulls off his shirt and climbs onto a small mound of snow, flexing an arm as he poses for the camera. Sandra is unimpressed. “The Americans are worse—sometimes they come here and strip naked.” I wonder what else she has witnessed on the snows of the Jungfrau. Later, over a hearty lunch of fondue, Sandra brings up a fascinating chapter of World War II. Interlaken became a command center for the Swiss generals, who recognized the dire nature of their situation in June 1940, when Switzerland became completely encircled by the Axis powers. Plans were activated for a “national redoubt,” pulling the majority of troops back toward the naturally fortified center of the country. The scheme would have allowed the Germans to take the plains and cities, but left the Swiss in control of the high passes and the crucial infrastructure within. A Swiss friend once told me that secret hangars were carved out of the mountains as part of their wartime defense. It sounded far-fetched at the time, but now that I was here, I couldn’t doubt the prowess of Swiss engineering. If they could build railways through the high Alps, and a curving tunnel through the glaciers and solid rock of two 4,000-meter peaks, what couldn’t they do? One day, I head to the mountains immediately to the north of Interlaken, the Lombachalp, to gain another perspective on the Jungfrau. En route to the trailhead, my twentysomething guide Bettina Vögeli tells of the historic rivalry between Bern and its rural hinterlands. She relates how a sports competition was once held between the city and the farmers of the highlands. Knowing the stronger rural folk would win, the shrewd Bernese recruited Austrian farmers to compete on their behalf, on the one condition that they wouldn’t say a word. The Austrians went on to win, but in the merriment that followed, with tongues let loose by a flow of beer, the local farmers realized they had been cheated. Regardless, the games, known as Unspunnenfest, are still held every 12 years today, headlined by stone throwing, wrestling, and yodeling (the next one takes place this August). Bettina says her father and brother regularly compete. 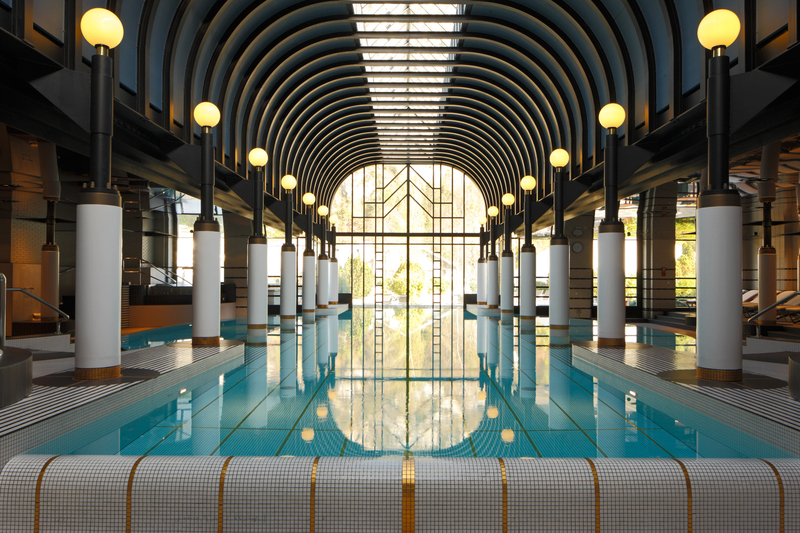 The pool area at the Victoria-Jungfrau Grand Hotel’s Spa Nescens. Photo courtesy of the hotel. What sets the Lombachalp apart from other minor ranges is the presence of one of the largest tracts of moorland in the country. Basel-born ranger Lukas Schärer is there at the trailhead to greet us, and after a quick briefing we are off on a hike up the hillside, to reach a ridge where the Jungfrau is clearly seen. Along the way, Lukas speaks of the local wildlife: lynx, deer, snow hares whose coats change from brown to white ahead of winter, and shy, noise-sensitive black grouse, who gather in the marshes each spring to find a mate. Efforts to keep visitors on well-defined trails have paid off, and the numbers of black grouse have gradually rebounded since rangers were introduced in 2007. We turn our attention to the rugged trio rising to the south: Eiger, Mönch, and Jungfrau. From our perch, the Sphinx Observatory is barely perceptible—a blip on a shoulder between two giants. Beyond them, the Rhône flows westward into Lake Geneva before veering south toward the Mediterranean. Looking the other way, I can’t make out the Lombach River babbling in the valley below, but Lukas tells me it will eventually join the Aare, a tributary of the Rhine. “We call ourselves the water fortress of Europe,” he says. The glaciers and rock faces of the Jungfrau massif are a stark contrast to the forested slopes of nearby Männlichen, a 2,343-meter peak. Photo by Clara Tuma. It strikes me as a poetic description for a landscape so deeply wrought by the movement of ice and water. For what would Switzerland be without its many lakes and rivers? 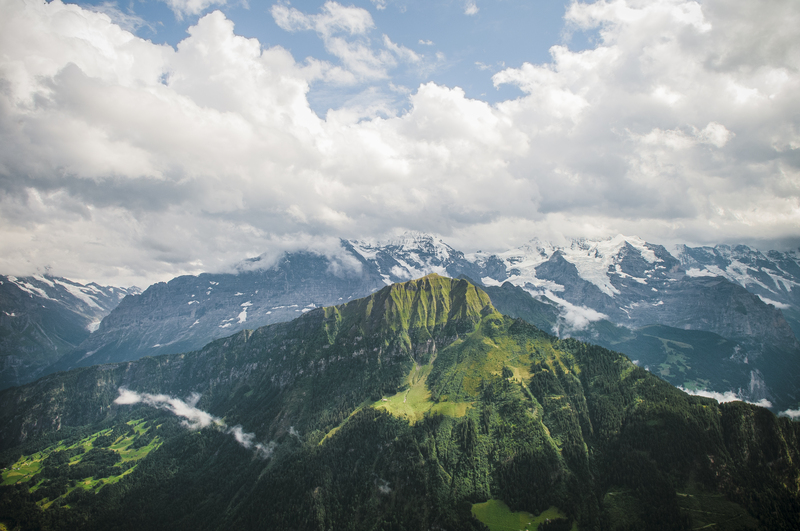 Interlaken might not have even existed—the small plain on which it stands was formed by glacial moraine deposited over thousands and thousands of years. Eventually we descend the trail back to the mountain hut housing Lukas’s office. On the ground floor, Bettina and I step inside the cozy Jägerstübli, a space of exposed woodwork and red-and-white checkered tablecloths. The telltale aroma of mountain cheese being melted in a saucepan fills the room. It’s immediately comforting, and I soon opt for a simple meal of chäsbrätel, a slice of crusty bread topped by a thick layer of grilled cheese. A powdered seasoning with garlic and turmeric gives the dish an extra lift. My choice of dessert—sourced from a small bakery in the nearby village of Habkern—is nussgipfel, a glazed pastry that strikes me as a heartier version of a croissant, but with a filling of ground hazelnuts and melted sugar. Interlaken is just over two hours by train from Zurich, with one change in Bern. The Victoria-Jungfrau Grand Hotel & Spa (41-33/828-2828; doubles from US$644) is the place of choice for luxe stays in the heart of town. 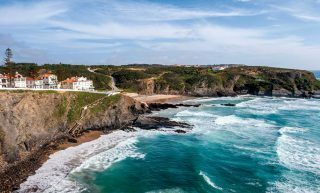 Its recently renovated spa facilities and award-winning Italian restaurant, Quaranta Uno, are two highlights. The Lindner Grand Hotel Beau-Rivage (41-33/826-7007; doubles from US$227) is another five-star heritage property, located a short walk from Interlaken Ost station. From Interlaken, the daylong excursion to Jungfraujoch is highly recommended. Some of the best white-water rafting in the Swiss Alps can be enjoyed on the nearby Lütschine River, with outfitters such as Alpin Raft running trips between May and the middle of September. For a thrilling bird’s-eye view of the Bernese Oberland, Paragliding Interlaken offers tandem flights in the summer and winter months. This article originally appeared in the April/May 2017 print issue of DestinAsian magazine (“From Shore to Summit”).